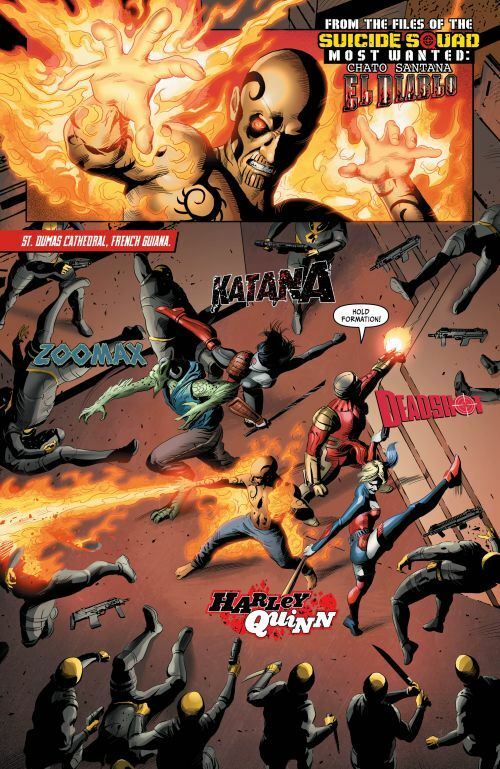 Suicide Squad Most Wanted: El Diablo and Boomerang is the second Most Wanted miniseries, following the one devoted to Deadshot and Katana. Like that miniseries, this six issue series is split between two stories, each one featuring one of the Suicide Squad members that (not coincidentally) appear in the forthcoming movie. The first of the two stories in the issue is by Jai Nitz and Cliff Richards, and deals with El Diablo. El Diablo is one of the more noble characters in the Suicide Squad, cursed with his fiery abilities but tormented by them, and seeking redemption. Nitz does an excellent job in this opening instalment, putting El Diablo into the middle of a power play by both Amanda Waller and a new formation of Checkmate. El Diablo is none too keen on the murderous and maniacal Squadders he has to work with, and even less impressed with the manipulative Waller. Although this first chapter does not reveal all its cards, I think it’s safe to say that the members of Checkmate who successfully recruit him will prove to be just as devious as his former employer. The story also brings back Uncle Sam, last seen as the leader of the Freedom Fighters, now the White King of Checkmate. Richards art is quite good, although perhaps a little too clean for the story. I should point out that, contrary to Suicide Squad: Rebirth, this tale features the thin version of Amanda Waller. 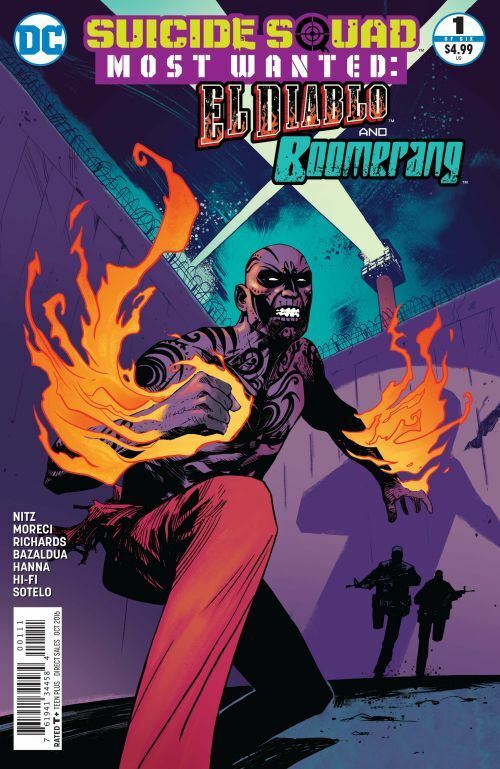 I am not as keen on the Boomerang story in the issue, by Michael Moreci, Oscar Bazaldua and Scott Hanna. Digger Harkness became one of the most charmingly repulsive characters in the DC Universe during John Ostrander’s time on Suicide Squad, and later writers kept the character a completely selfish and untrustworthy slimeball. In this chapter, the first half of the tale sees Boomerang working alongside his teammates on a mission in South America. He gets left behind, assumed to be dead, and so only the latter half of the debut tale gives him an opportunity to shine. And even then, it doesn’t really take it. There is a lot of fighting and action, and some interestingly weird opponents for Boomerang, but not once did I feel the delightful loathing that his personality usually evokes. If anything, he felt almost like a generic hero tossed into the tale. The art is not bad at all, the saving grace I suppose, as the strange characters Boomerang has to deal with are well rendered enough to make the story readable. But all I can really say for this first instalment is that I hope Moreci gets a firmer handle on the character as the miniseries goes on.